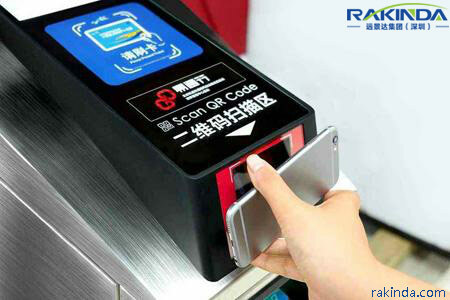 Rakinda 4500 series qr code reader module are designed for simple and fast integration into access gates, turnstiles and ticket kiosks. They deliver fast reading performance in the application. Even when the smart phone screen is covered with protective film or its brightness is set to low level, the 4500 serious scanners can still scan the qr code very fast. Some people may wonder IC card has been used very well for a long time. Is it necessary to upgrade the turnstile with qr code scanner configuration? Well the answer is Yes. Turnstile with qr code reader has been used in many places. Especially in Metro Station in metropolis, such as Guangzhou China, there is always long queue before single tickets kiosk. It is time-consuming to buy single tickets. With the launch of new turnstile with qr code reader in Metro Station, this situation has been relieved. Since the qr code reader turnstile is in piloting process now and only some exits have such turnstile, we only find that more turnstile with qr code reader are needed because there is new queue in front of such turnstiles. The RD4500-20 qr code reader provides USB or serial cable interface. The interface of controller inside turnstiles decides which cable to use. Serial cable are widely used. But some times the controller PCB board used by clients only offers wiegand interface. We also provide RS232-Wiegand convertor. In this way, the users can connect the qr code reader to their controller board through Wiegand interface directly. It is really easy to install the qr code reader into turnstile. Rakinda, established in 2000, has been focused on barcode scanner products for 18 years. Please kindly contact us to know more about qr code readers.